Educomp Solutions Ltd has sold its entire stake in Singapore-based Wizlearn Technology Pte Ltd to V-cube Global Services Pte Ltd, the debt-laden Indian education company said in a stock exchange filing on Monday. The company had acquired Wizlearn, then known as Asknlearn Pte Ltd, in 2007 for S$7 million in cash and options ($4.6 million, or Rs 18.5 crore then). It had later transferred the stake in Wizlearn from its subsidiary Educomp Asia Pacific Pte Ltd to Educomp Intelliprop Ventures for $9 million. The firm did not give the deal value with V-cube but said it made a 57 per cent return on its original investment. In a separate disclosure, V-cube said it is paying S$20 million ($14 million, or Rs 92 crore). Educomp said it will use the money to repay debt to Axis Bank. Founded in 1994, Educomp was once India's largest education company. It piled on huge debt with a business model gone wrong. It has been divesting assets to pay back its lenders. Last year, Educomp divested its entire 55.41 per cent stake in the engineering exam training arm Gateforum Educational Services Pvt Ltd to private equity firm ASK Pravi Private Equity Opportunities Fund. In 2013, it sold its 50 per cent stake in pre-school chain EuroKids International to a consortium of financial investors led by Gaja Capital Partners. The same year, it also sold its stake in IndiaCan Education to its joint venture partner Pearson. News of the latest deal boosted Educomp shares on the Bombay Stock Exchange. The shares jumped 12 per cent to close at Rs 12.74 each in a strong Mumbai market. However, the shares are still down 63 per cent from their one-year high of Rs 34.35 in November last year. In July this year, investment firm Mount Kellett Capital Management and International Finance Corp had exited Educomp at a huge loss. Educomp said the latest deal includes the sale of three associated step-down subsidiaries â€“ Singapore Learning .com Pte Ltd, Pave Education Pte Ltd and Wiz Learn Pte Ltd.
Wizlearn is an e-learning solutions company that provides customised content to its clients and employs 137 people. The 16-year-old firm has a strong presence in Singapore with 50 per cent share in the city-state's public schools with 500,000 users. It also offers services to enterprises such as Japanese lender Bank of Tokyo-Mitsubishi UFJ for corporate training. V-cube Global Services, a subsidiary of Japan's V-cube group, provides web-based video conferencing services to corporate users. 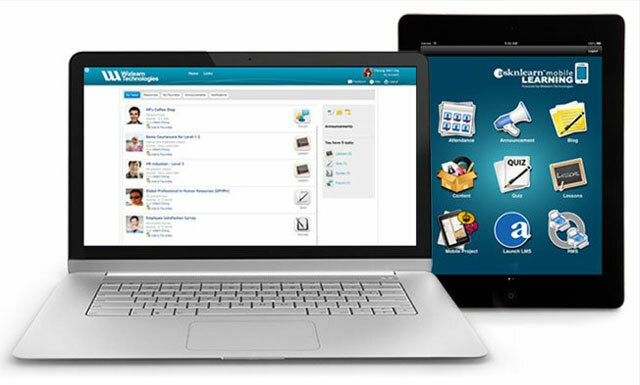 It said Wizlearn's services can be integrated with various back-end systems such as Microsoft Active Directory, SAP and Oracle Peoplesoft. Educomp Solutions Ltd. V-cube Global Services Pte Ltd. Wizlearn Technology Pte Ltd.